Triple Levered ETFs Will Make You Go Broke… Even If You’re Right! Things get messy if you want to amplify returns using leveraged ETFs. Investors should completely avoid trading any type of ETF, levered or unlevered, unless they understand exactly what’s going on under the hood. And that means actually taking the time to read the mammoth prospectus of the product in question. We know most amatuer traders never bother to look at a 190-page prospectus. And so, with the recent popularity of oil gambling, we thought it prudent to dissect the triple-levered oil ETN — UWTI. We can only hope that a few of you will listen to our warning and not burn through your precious account balance in the levered oil casino. To be clear, ETNs like UWTI are technically not ETFs. ETNs are “exchange traded notes.” An exchange traded note is a senior, unsecured debt security that a bank issues. Senior — The first tranche of debt a company has to pay out of it goes out of business. Unsecured — A loan not backed by an underlying asset. These notes are tied to a benchmark. The bank promises to pay the investor the performance of the benchmark minus fees. UWTI is the Credit Suisse backed, 3x levered-long crude oil ETN. 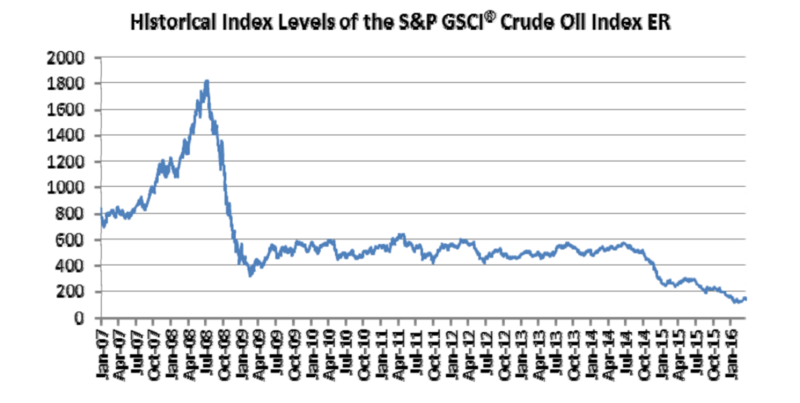 It tracks the daily movements of the S&P GSCI® Crude Oil Index while offering three times the index’s daily gain or loss. This means that if the oil index rallies 1%, UWTI should rally about 3%. And if the oil index falls 1%, then UWTI should fall about 3%. Keep in mind that the oil index itself does not track the spot price of oil perfectly. It suffers from the same problems we outlined here due to the “roll effect” in the futures market. You can see below that the index never really recovered from the 2008 fall. Oil’s price fluctuations are volatile as it is. But if you throw 3x-leverage on top of them, you’ll get returns more unpredictable than next week’s lotto numbers. That’s what you’re facing when trading something like UWTI. This unpredictability is due to something called volatility drag. Vol drag is a well known concept in professional quant land. It occurs in all price series due to negative compounding, but its effect is exacerbated and easier to see in a levered ETN like UWTI. Vol drag is not as complex as quants make it out to be. To understand vol drag, all you need to know is that a loss hurts more than a comparative gain. Imagine your account earns 10% one week and loses 10% the next. If you started with $100, your account would go up to $110, and then down to $99. The result would be a net-loss. You do not end up breakeven and back at $100 as many would believe. Negative compounding prevents that from happening. The reality of negative compounding is what creates vol drag. The more price fluctuates up and down, the more you lose out. And if you take this same situation and apply 3x the leverage to it, the downside becomes even worse. Using the 3x-levered UWTI as an example, let’s say the oil index started at $100, gained 10% one day and then lost 9% the next. This would translate into UWTI gaining 30% on day 1 and falling by 27% the next. For simplicity reasons, let’s say that UWTI is also priced at $100 a share. The chart below shows the final values of the oil index and the leveraged ETF. The index ends up right around where it started. 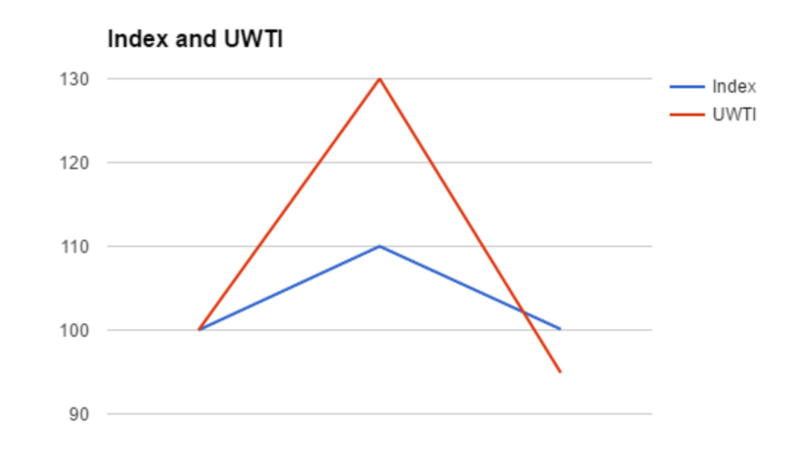 But UWTI falls lower than the index and actually finds itself underwater! The leverage embedded in UWTI causes this underperformance, which then compounds over time and has a large negative effect on total returns. Many investors fail to realize that placing a long oil bet in UWTI is far more complex than guessing if the price of oil will be $20 higher or lower next year. These gamblers that are long UWTI are also making a realized volatility bet. Realized volatility is a quant measure for how much price oscillates up and down. If price oscillates wildly, realized vol will be high. If price moves smoothly in a slow “drip drip” fashion, then realized vol will be low. The higher realized volatility you have, the more vol drag you get. And as we saw above, vol drag is not good for returns. In both these examples, the oil index goes from 100 to about 131. But they take very different paths to get there. In the example on the left, the index finishes at 131 in a smooth “drip drip” fashion. UWTI finishes around 171. The gambler outperformed. Index 31% gain. Gambler 71% gain. Fire up the jets to Cancun baby! On the right, the index finishes at 131 as well, but the path looks more like a hi-speed roller coaster ride. In contrast to the smooth scenario, UWTI finishes right around 100. Uh oh. Index 31% gain. Gambler 0%. No vacation this year. So even though the oil index finished higher, UWTI made NO money at all. Zip. Nada. Zilch. And here lies the plight of gambling with levered ETFs. If the price path is noisy and jagged, you end up with piss-poor results, even if you were ultimately right on the direction of the index! If you’re wrong, and the oil index finishes lower, forget about it. Your account is taking heavy damage and your spouse is about ready with the divorce papers. The administrators of the UWTI ETN actually talk about this in the prospectus, but of course no one reads it. If you want to compete in this game over the long run, then stick with trading outright oil futures rather than UWTI, DWTI, or even USO. Don’t gamble. If you’re unfamiliar with futures and how they work, we wrote a special report on them specifically for beginners. Good luck out there. https://i1.wp.com/macro-ops.com/wp-content/uploads/2016/04/fire-e1461608222612.png?fit=700%2C302&ssl=1 302 700 AK https://macro-ops.com/wp-content/uploads/2016/02/Macro-Ops-logo-e1456504515714.png AK2016-04-25 14:10:162017-10-17 11:23:24Triple Levered ETFs Will Make You Go Broke... Even If You're Right!